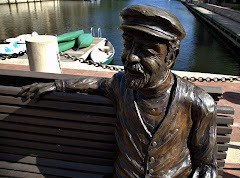 Restonian: News blog from Reston, Virginia, the mauve-colored New Town (tm): Reston Tea Party: You Damn Kids Get Off My Lawn! Reston Tea Party: You Damn Kids Get Off My Lawn! No, this isn’t an advance clip from tonight’s episode of The Office. Hopefully you decided to hold off on filing your income taxes last night, because as a result of a bunch of people standing in a rain-swept field in Reston, the federal government has abolished all income taxes, forever, and President Obama has been turned over to the Hague as a war criminal. Good job, gang! The Reston Tea Party was moved at the last minute from Lake Anne Village Center to the soccer fields at Baron Cameron, so you know who to blame if Junior slips on a tea bag during this weekend’s soccer games. You know it’s going to be a fun event when in the opening lines of the featured speaker’s remarks refer to this humble site as a “lefty blog,” despite our fearless opposition to nekkid community theatre, which all liberals are required by law to love upon pain of immediate extradition to Texas. It’s sort of a litmus test. 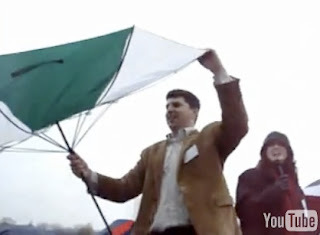 Despite a brazen attempt to disrupt the event by the above-pictured treasonous, left-leaning umbrella, the rest of the speech was a history lecture about how some filthy Colonial types complained about tea or something on their 1700-era “web-logs” (those town crier guys with bells and sandwich boards), plus a few cute offhand comments from the crowd about liberals "killing babies" for comic relief, the end. wait...we have to be liberal to enjoy your blog? dang...I thought we just had to be free-thinking! It figures that this protest would be moved to Brown's Chapel. The very idea of Right-thinking people performing acts of teabaggery in a public park is so North Reston. Convict: Baron Cameron Park and Brown's Chapel Park are two different parks. (Though they are right next to each other.) The event was held at Baron Cameron Park.